if i copy to an artboard, and then change the image on it, the image on the artboard i copied will also be changed..how can i prevent that ? I honestly don't get the point either. But I find it very handy that I can switch to edit mode with a double click on an artboard and change motif and text, but it would be nice if these changes were not transferred to the artboard I copied. Can you confirm the exact steps you take from creating your document onwards so I can confirm whats occurring. Is this understandable? Should i set the user interface to english? The only way I can duplicate what you describe is if the content of the first artboard is a symbol, like in this Artboard & copy with symbol.afdesign file. i don't know what a symbol is or how to create it, but as i understand it in this case such orange markings are visible .. right? Probably i missed something obvious. i actually want to be able to edit pictures and text. Can I disconnect an existing connection? 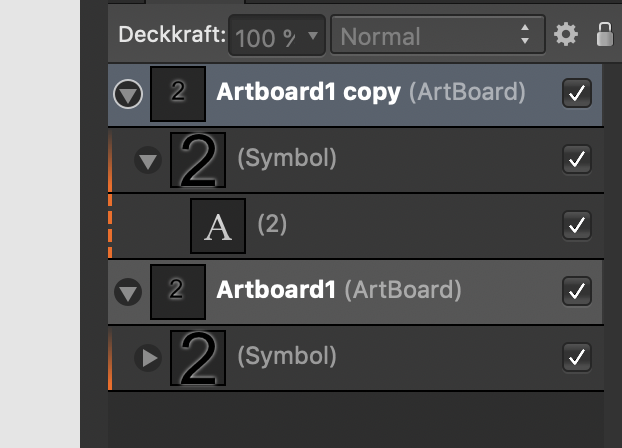 Or in other words, can I copy an artbord without creating a connection? Once you have your Artboards setup you can use the tools available such as Text Tool and Place Image (File menu) to insert content onto each Artboard, these can then be edited individually. An Embedded Document doesn't have an option to be unlinked, another option is to open the embedded file double-clicking on it (it will open in a new tab) copy the contents of it to the clipboard and paste them in the original document. Then duplicate those as needed, they will be independent from each other. The best way to do this is to avoid embedding anything in a new file that you don't want connected because it is an embedded file. If you still have the original Qube1 file, open it (or a duplicate of it if you want to keep an unaltered version of the original), & if necessary convert it to an artboard using the Artboard tool. 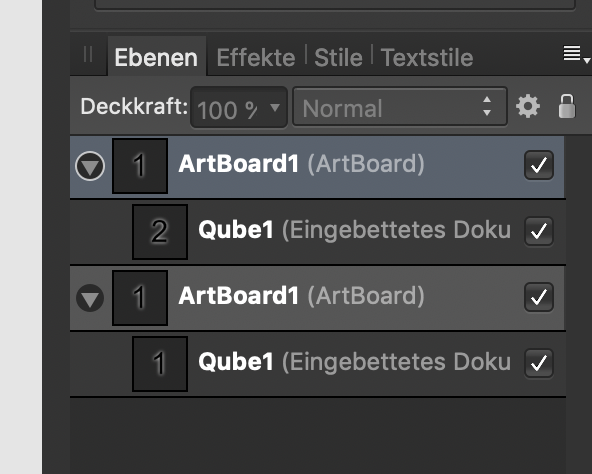 Then you can duplicate the artboard with the Qube1 content without creating any embedded document connections between the two artboards. If you do not still have the original Qube1 file, in the file with the embedded document, double-click on the "1" (or anything else in a artboard with an embedded document in it) to open that document in a new window. It will have the title "<embedded>" & can't be saved, but you can select all its layers, copy them to the clipboard, & create a new Qube1 file using File > New from Clipboard. EDIT: Lee beat me to it! BTW, Symboles are a way to create multiple instances of the same object in a document. Embedded documents are sort of the same thing, except they are entire document files. Another way would be to select one of the embedded documents with the Move Tool, click on the Replace Document button and replace the document with exactly the same document from your hard drive. You then have 2 ArtBoards with the same embedded document but they are not linked in any way. The best way to do this is to avoid embedding anything in a new file that you don't want connected because it is an embedded file. ﻿If you still have the original Qube1 file, open it (or a duplicate of it if you want to keep an unaltered version of the original), & if necessary convert it to an artboard using the Artboard tool. 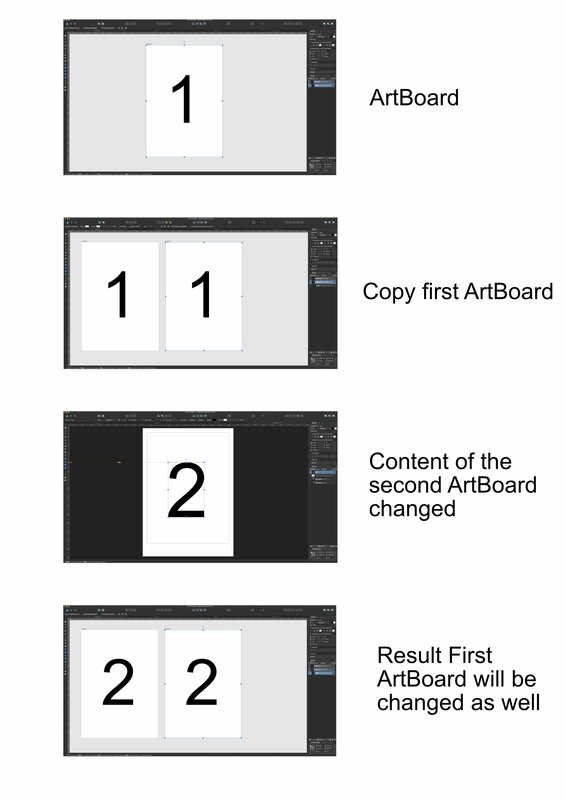 Then you can duplicate the artboard with the Qube1 content without creating any embedded document connections between the two artboards. "The best way to do this is to avoid embedding anything in a new file that you don't want connected because it is an embedded file. " I wasn't planning on an embedded file.. If you use the File > Place command, the Place Image Tool, or drag & drop a file in the native Affinity file format into your document, you will add an embedded file to it. Files with either the .afphoto or .afdesign extension use the native Affinity file format (& presumably that may also eventually apply to ones with the .afpub extension). So when you don't want that, you should avoid using those methods to add content to your file, & instead use one of the other methods mentioned here to add or replace their contents to your document. thanks, this is basically a good function, but it would be nice if you could turn it off afterwards, just like you can convert a picture into pixels afterwards. Currently it's not possible to turn/convert an embedded document into native objects/layers directly inside the document. Simply double-click the embedded document to open it in a new document tab (or open the the original file you embedded using File ▸ Open to open it in an independent tab) and copy paste the layers/objects to the document where you need them as Lee D. explained above.